I hope your Thanksgiving was one filled with love and laughter and lots of fabulous food! Ours certainly was, and I was thrilled to be surrounded by family and friends whose love I treasure. With 28 tummies to fill, we had to set up in various locations around the house with a different theme in each area. The lower level had seating for the football enthusiasts, while the main level had a table for 10 in the living room and one for 6 in the dining room. 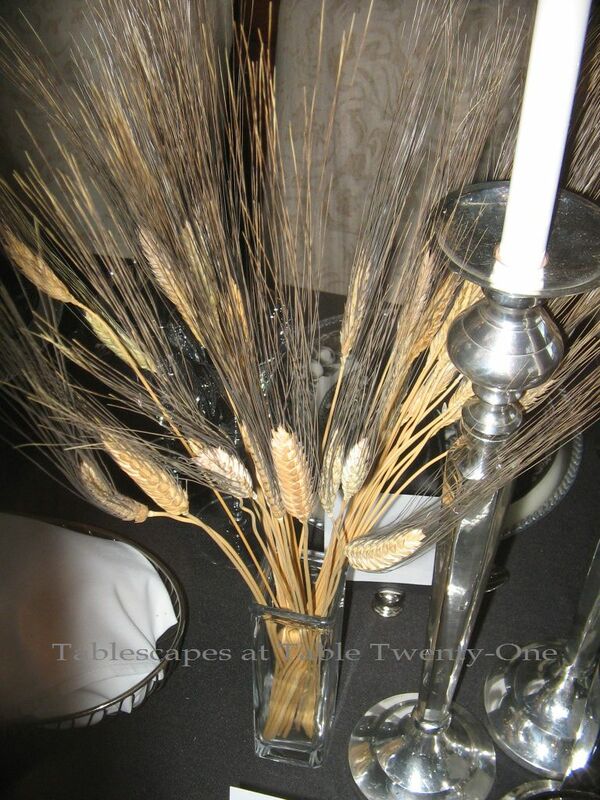 It is my understanding that wheat symbolizes prosperity and blessing. The dining room – with all the homemade breads and desserts on the buffet – seemed the perfect place to celebrate the fall harvest. While black and creamy white may not be a traditional Thanksgiving decor combination, I decided to buck the system and go for it! 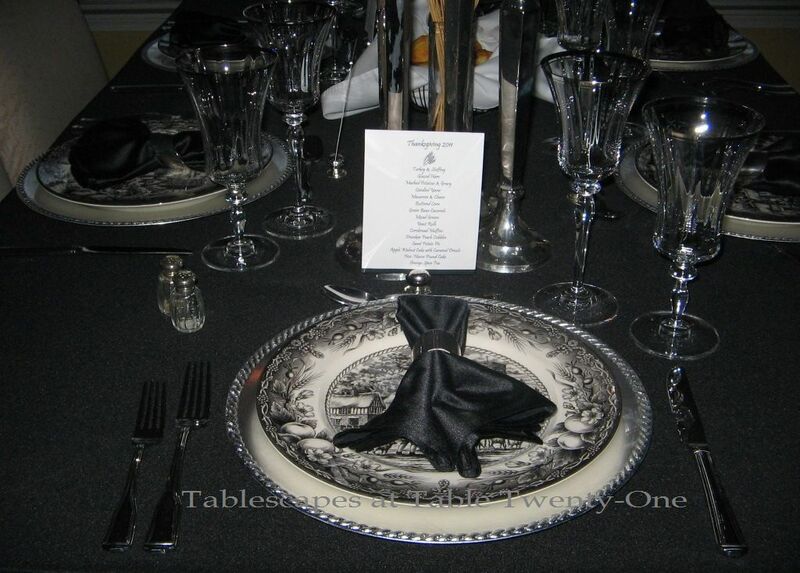 Inspiration for this black and white tablescape came from my Royal Stafford “Herdsman” dinner plates. 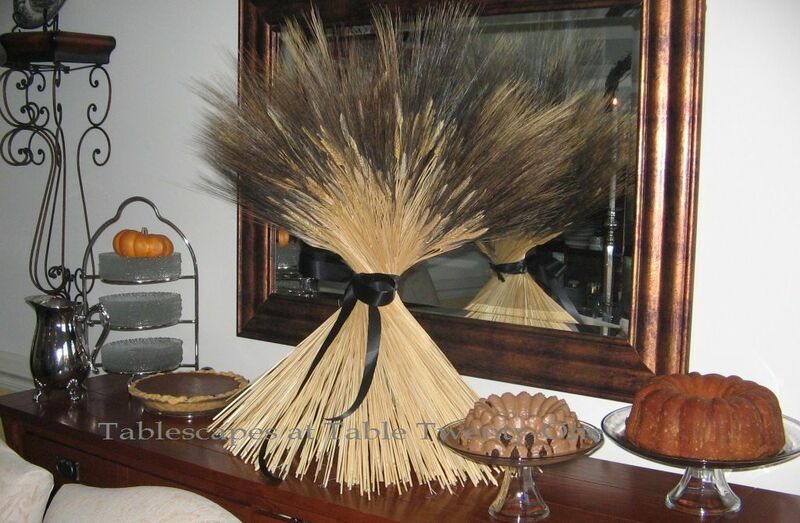 The rim is peppered with stems of wheat among the bounty of fruits and flowers. 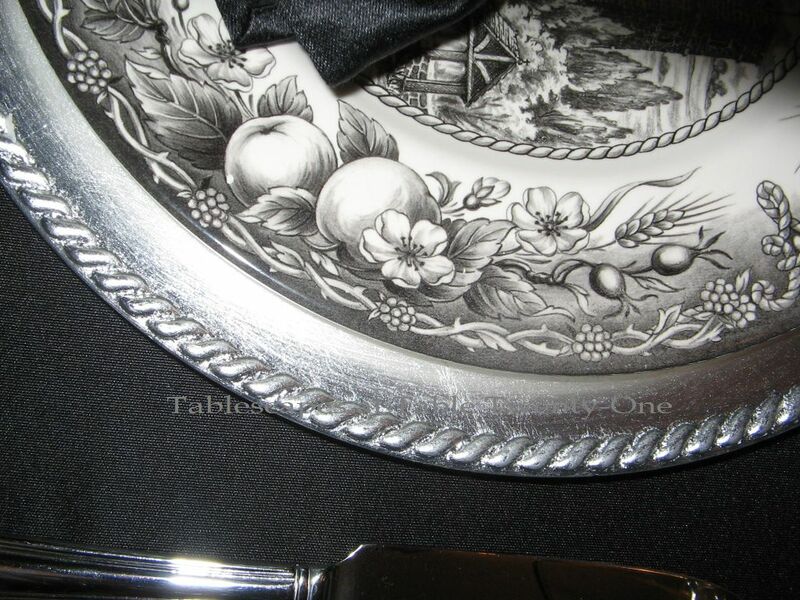 The braided rope rim of the charger imitates the design on the inner circle of the plate. 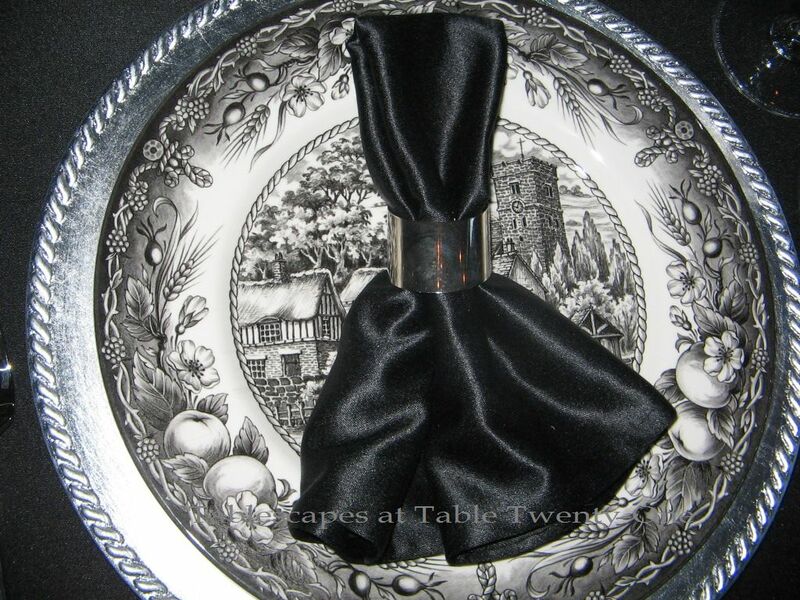 The black napkins are folded twice lengthwise then doubled over inside the silver napkin ring. I fanned out the bottom for a fuller look of this simple napkin fold. 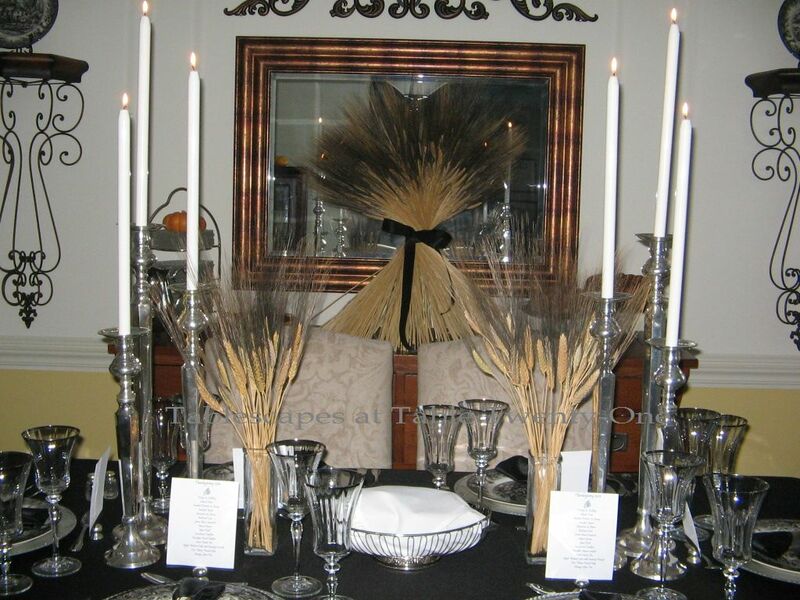 The centerpiece was kept simple with a few silver candlesticks and blackbeard wheat in square vases. The very center of the table was reserved for a silver bread basket filled with cornbread muffins and my sister’s fabulous yeast rolls. Looks like your house was the place to be yesterday! I love the way you buck tradition! 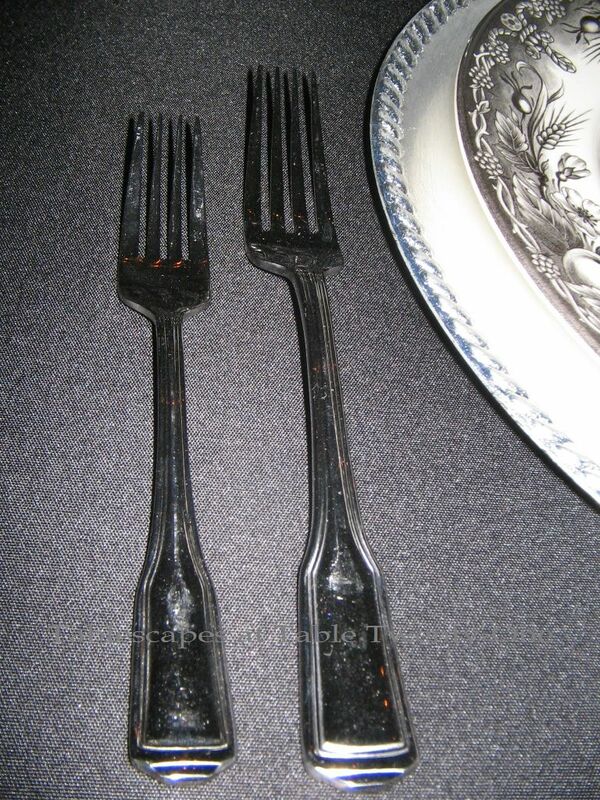 Wonderful presentation with the Transfer dishware. The black and white is so different than traditional. It’s great to think outside the box. Looks like a great family and friend event. I was kinda wonderin’ if there’d be enough food…then I saw the crowd assembled. 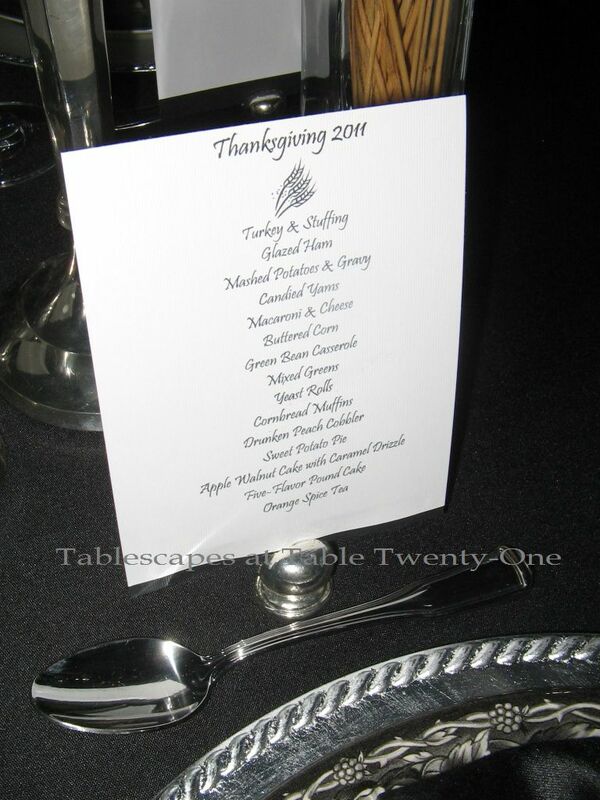 The tablescape was lovely, but you had me with the menu. So glad you had a lovely Thanksgiving with family and friends. WHAT LOVELY IDEAS YOU COME UP WITH!!!!! 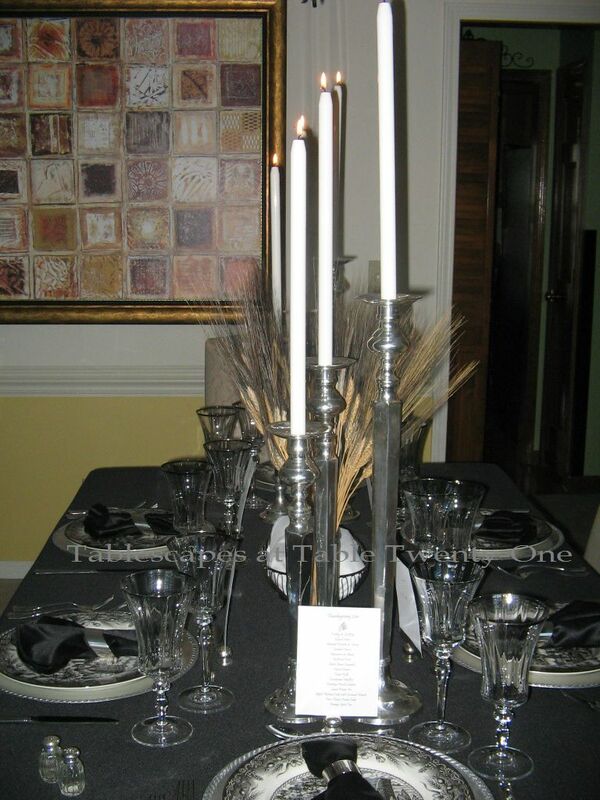 Stunning arrangements that so complement each other to make your meal an EVENT!!!!! AND WHAT A MEAL…. THREE CHEERS FOR THE CHEF!!!! Just when it can’t be outdone…you do it again and again….. Once again….MARAVIOSAMENTE!!!! Put your feet up, GLOW and think of the WOW for the next HOLIDAY!!! We had a Happy Thanksgiving at my mothers with lots of family and food, and thankfullness for so much. Thank you for sharing….. Happy Holidays backatcha!!!! Hi Alycia! I’m back…!! I am amazed at all the work you did for this holiday! I can hardly believe you had that many people over to feed! Your house must have been wall to wall people! 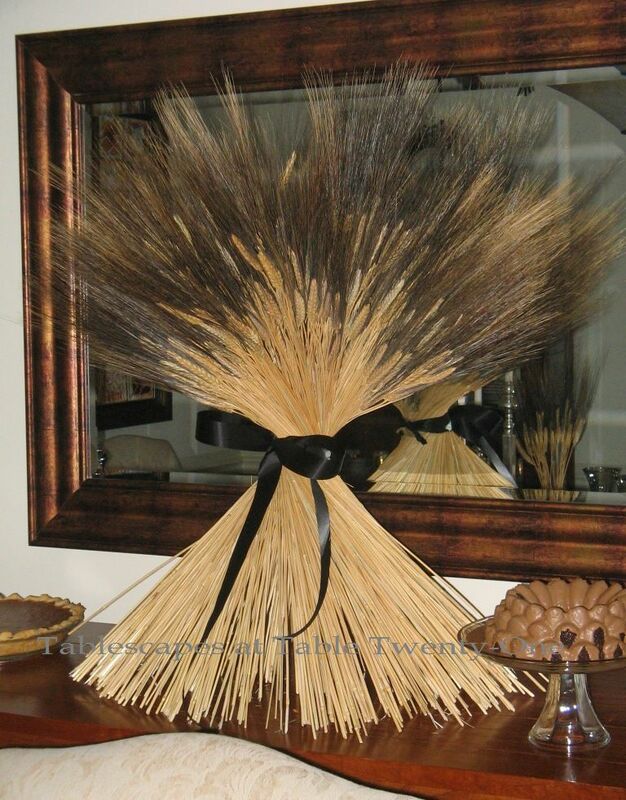 Love your table, and the wheat theme was a great idea! 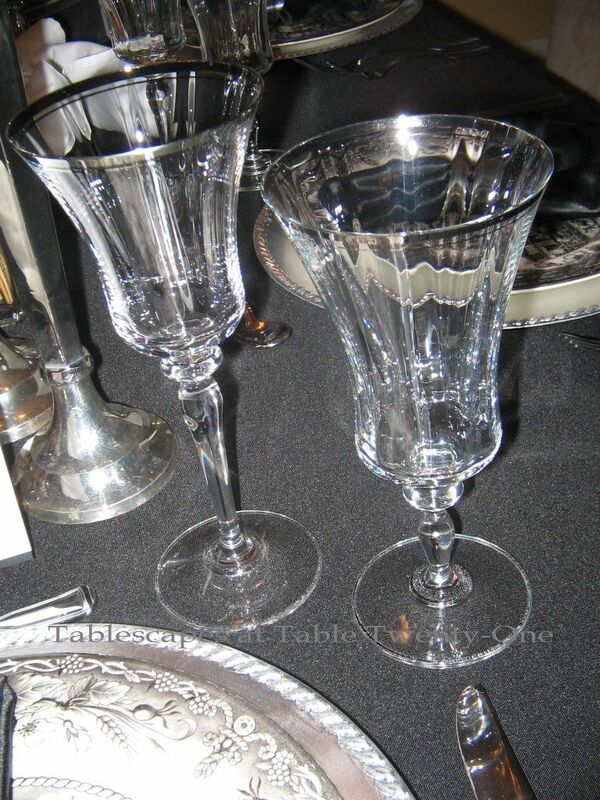 Your selection of dinnerware was perfect! Everyone must have felt very special. Most of all I love seeing your family and friends picture on the back deck! That’s awesome! We never appreciate these pictures until 5 to 10 years passes and we see their value. Glad to hear there were no more catastrophes, and as expected, you pulled it off!! Your table is beautiful, and the wheat is perfect; I didn’t know that there were different kinds of wheat, but the blackbeard is stunning! Interestingly, one thing I noticed right away was the bread basket…it added some texture or something that was interesting. Love that you do menus for all your dinners! I didn’t get to that this year! Beautiful, Alycia. I would have loved to see your football inspired table. 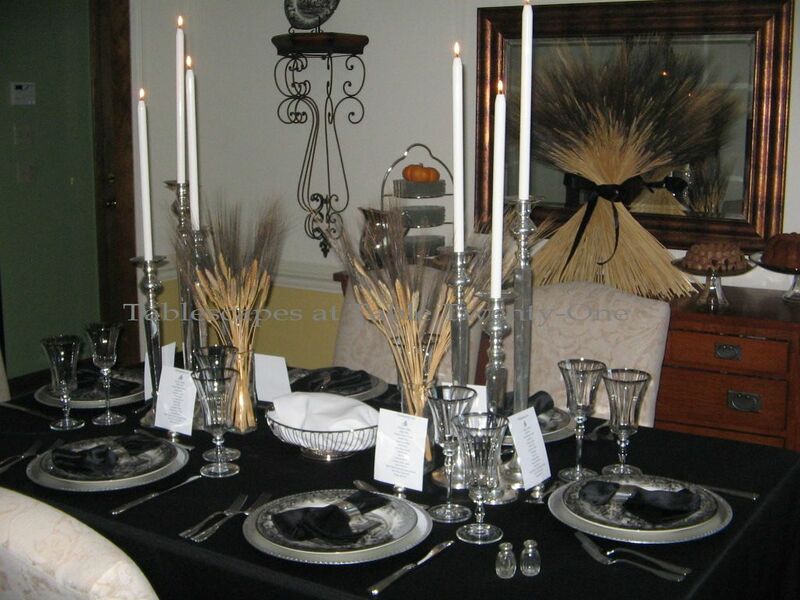 Your harvest table looks beautiful and your menu indicates you truly had a feast. Macaroni and cheese? Do you have young ones that request that or is it a tradition for the adults in your family? I love the family shot. So lovely and a precious memory for you.